The first semi-final of the 2014 FIFA World Cup is Brazil vs. Germany at Estadio Mineirao in Belo Horizonte on Tuesday, July 8th, 2014. The host nation qualified for the semis by topping Group A ahead of Mexico, Croatia and Cameroon and then eliminating Chile and Colombia in the knockout stage of the competition. Brazil have not impressed so far in this World Cup, but they are undefeated, they do have the home crowd support and they do have the refereeing decisions going their way. On Tuesday, Brazil will have to do without their captain, Thiago Silva, due to a suspension, and their 'heart and soul', Neymar Jr., who is out for a couple of months with a back injury. Germany have been comfortable, clinical and consistent so far in this World Cup. They won Group G ahead of USA, Portugal and Ghana, which they followed by victories over Algeria and France in the knockout rounds. This is the fourth consecutive World Cup semi-final for Germany. The nation's goalkeeper, Manuel Neuer, has been excellent so far in the tournament, while up front, Thomas Muller is a clear and present danger for the opposing goal. This could be a close one. The two teams have just about an equal chance of making it to the final, according to the odds. 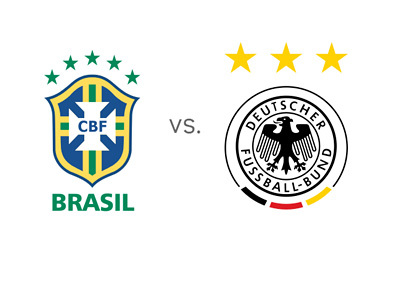 An inspired Brazil side, powered by the emotions over the Neymar injury, or the precision-engineered German machine? This could be a game to remember. The winner will play the winner of Argentina vs. Netherlands. Who will replace Neymar in the attack? Willian?